- SYRIE – Tal-al Qaramel - The Syrian-Polish archaeological expedition has finished its excavation works for the current year at the site of Tal al-Qaramel on the right bank of the Euphrates River, 25 km to the west of Aleppo. The expedition started its systematic excavation works at Tal al-Qaramel in 1999. The archaeological findings unearthed by the expedition are considered one of the most important archaeological discoveries in the world as they provided significant information on the first human settlement phase and the shift from the life of hunting to the stage of building houses and villages. Tal al-Qaramel is one of the most ancient archaeological villages in Syria and in the world. 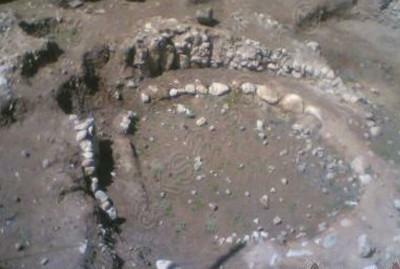 The excavation works led to discovering important archaeological monuments such as circular houses carved in the ground whose walls have been rebuilt with stones. The height of the unearthed houses was estimated at about one meter, and at their center the expedition discovered fireplaces whose floor equipped with high technology represented in using various organic materials, indicating that the building of the walls and roofs was completed through using wood. The number of the unearthed houses during the excavation season reached four, whose diameter ranged from 2 to 3 meters, adding that this gathering of houses indicates that there was a village, the houses of which were built according to the same architectural style and date back to the mid 11th century BC. The findings prove that there was human settlement at the bottom of the most ancient circular houses which date back to the 4th century BC. - ROYAUME-UNI – Golden Cap - Archaeologists have unearthed a watchtower from the Napoleonic era at the start of a dig into threatened Bronze Age burial mounds on the Jurassic Coast. The National Trust (NT) team is digging into 4,000 year old earthworks at Golden Cap to record their history before they slip into sea. So far they have unearthed the 18th Century wathchtower built to provide early warning against a French invasion and watch Channel shipping but will be digging deeper into the mounds. The Napoleonic era watch station was built on the summit of Golden Cap in the late 18th Century to watch shipping in the channel. The builders of the 18th century watch station used some stone from the burial mounds to create a flat platform and left behind a few traces of their presence. Items uncovered include the fragments from a large food bowl, some badly eroded coins and buttons. - FRANCE – Viry Noureuil - Depuis la découverte de traces d'habitations datant des Gaulois, les travaux de la rocade sud sont suspendus dans l'attente du verdict de l'État. À l'époque, les fouilles archéologiques menées par le Département avaient révélé des traces d'habitations remontant à la période gauloise et romaine, sans oublier la découverte d'une sépulture mérovingienne. Présence d'une nécropole ou pas, avec en perspective d'autres découvertes plus grandes encore ? Pour l'heure, personne n'en sait plus. Les Gaulois et autres Mérovingiens attendent eux aussi de savoir si les archéologues reviendront les chatouiller et percer, pourquoi pas, leurs secrets. Pour l'heure la décision appartient à la Drac et paraît être renvoyée aux calendes grecques… ou plutôt romaines. - FRANCE – Fouras - Les scientifiques avaient pu l'établir depuis longtemps à force de témoignages, observations, enquêtes et recoupements. 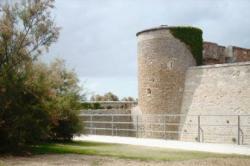 Le fort Vauban, ou sémaphore de Fouras, avait, au Moyen Âge, une taille suffisamment importante pour forcer le respect et menacer l'ennemi tenté par une incursion entre l'île Madame et le continent. Des constructions diverses (casemates, casernements et renforcement du donjon) ont confirmé, au fil du temps, son utilité et l'ont maintenu en activité militaire durant plusieurs siècles. À la faveur du projet de refonte du front de mer ouest, des fouilles préventives obligatoires viennent d'avoir lieu et ont permis de marquer en gras les tracés restés incertains sur bien des plans. « Un mur de toute évidence médiéval a été découvert sur l'espace vert du côté est du fort », précise Benoît Lacoste, responsable du musée de la presqu'île. « C'est important car cela identifie plus clairement l'enceinte. Non seulement le mur est de très belle facture mais il délimite le mur extérieur, la première enceinte. Il permet de confirmer qu'elle était vaste, donnant au fort une ampleur que l'on ne distingue plus vraiment aujourd'hui. » Les coups de godets de la pelleteuse ont également, sur le parvis du fort cette fois, rendu à la lumière le soubassement des bâtiments qui ont abrité les troupes à partir du XVIIe siècle. - CANADA – Casselman - An Ottawa archeologist has discovered a rare site of human activity in Eastern Ontario from between 3,500 and 9,000 years ago. Paul Thibaudeau, an adjunct professor at Carleton University, has been leading a team of archeologists, students, and volunteers collecting artifacts from a dig near Casselman, east of Ottawa. It is only one of a half-dozen sites in Eastern Ontario that are considered reliable evidence of human presence during the period. Thousands of stone items have been found at what Thibaudeau said was an obvious portage around a waterfall and rapids on the South Nation River. The spot is believed to have been a temporary hunting and animal-skinning camp. Small stone tools used in skinning, remnants of tools, and waste from the toolmaking process have been found. “They were coming, staying briefly, and moving on, that’s what we can tell right now,” he said. Work last summer and in recent weeks has unearthed more than 7,000 items. Many of these are made of stone from southern Ontario, western New York State, Pennsylvania and Northern Quebec, confirming earlier discoveries that migratory people hunting and fishing in Eastern Ontario participated in a vast trading network. The river is thought to have remained unchanged since the disappearance of the ancient Champlain Sea some 10,000 years ago and has always been a human transportation route. The dig consists of two separate locations more than a hundred metres apart. One closer to the river has revealed mostly quartz stone tools, while another on a crest of land overlooking a floodplain has delivered mostly chert, a stone that breaks into sharp edges. The stones were used as scrapers, arrowheads and in woodworking, Thibaudeau said. He said there is nothing to indicate the people belonged to any First Nation group that is recognizable today. Other notable archeological finds in Eastern Ontario are lanceolate points found on islands in the St. Lawrence River near Cornwall which are thought to be at least 8,000 years old. Copper artifacts, including harpoon heads, originating from the area around Western Lake Superior and thought to be 6,000 years old, were found on islands near Pembroke in the Ottawa River during the 1960s.Work done in 2004 near Pendleton, northeast of Casselman, unearthed about two-dozen fire pits thought to be 4,000 years old. The pits were used in the processing of butternuts by hunters who did not remain in the area. - SYRIE – Tel Halaf - A previously unseen photograph of Lawrence of Arabia taken at an archaeological dig in the Middle East before he rose to fame has emerged for sale. 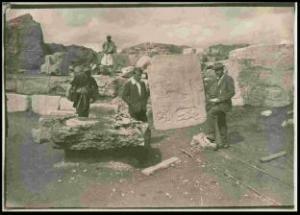 He is pictured in 1912 looking shy and standing next to an ancient find of carved rock depicting a bowman in the back of a chariot. TE Lawrence was visiting the archaeological site in Tell Halaf in Mesopotamia - modern-day Syria - from another dig nearby that he was involved with. The site was being excavated by Germans Max Freiherr von Oppenheim and Robert Rauschenberg. 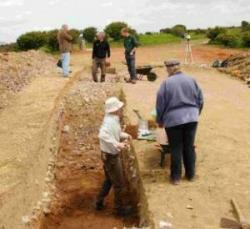 One of their team took many photographs of the dig, including one of Lawrence when he visited. The album of snaps is also an important record of what archaeological items were discovered during the dig, as many might not have survived. The site dates to the 6000 BC and was later the location of the Aramaean city-state of Guzana or Gozan.